An underground blast sent a 100-pound manhole cover flying into the air in Manhattan Monday, nearly hitting two people walking by before it came crashing down just outside the doors a popular restaurant, exclusive video obtained exclusively by News 4 shows. Marc Santia reports. 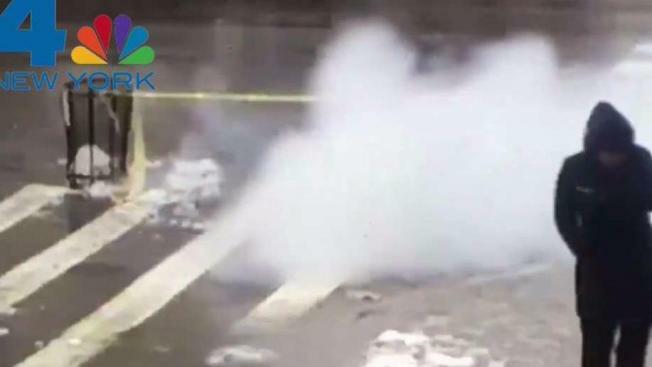 An underground blast sent a 100-pound manhole cover flying into the air in Manhattan Monday, nearly hitting two people walking by before it came crashing down just outside the doors a popular restaurant, exclusive video obtained exclusively by News 4 shows. The manhole exploded on East 75th Street and Second Avenue. 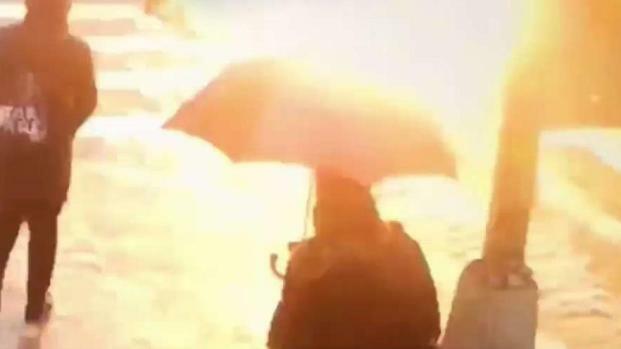 Video shows the exact moment it burst: at least two passersby strolling down the street tucked their umbrellas under their arms and fled; smoke shrouded the icy sidewalk. The cover ended up just outside the doors of Thep Thai Restaurant. Moments later, another manhole across the street exploded. "There was a loud bang on 75th Street and then after about 15 to 20 mintues, there was another loud bang in the corner of 76th Street," said Ryan O'Neill, who felt the explosion from inside a nearby Starbucks. "Two loud bands and quite a bit of smoke came up after that." Video obtained exclusively by News 4 shows the exact moment a manhole on the Upper East Side explodes, startling passersby. Marc Santia reports. Con Edison crews responded as well as the FDNY. The utility says there were no power outages. Two people had minor injuries, and the FDNY was going from business to business to check carbon monoxide levels. Runoff from the rapidly melted snow brought by the early morning storm could lead to more electrical fires underground, Con Edison warned Monday. When a pair of manhole blasts rattled lower Manhattan during the evening rush in late March, fire officials reminded the public that underground fires and explosions aren't uncommon in the city following wintry storms. The tri-state had just seen its fourth nor'easter of the month. "Salt and snow melting and going into manholes, it decays the rubberized coatings on the electrical conduits and starts fires," said Joe Schiralli, an FDNY deputy chief. "It happens every winter."